YourType™ Bluetooth ® Wireless Keypad is rated 1.7 out of 5 by 36. 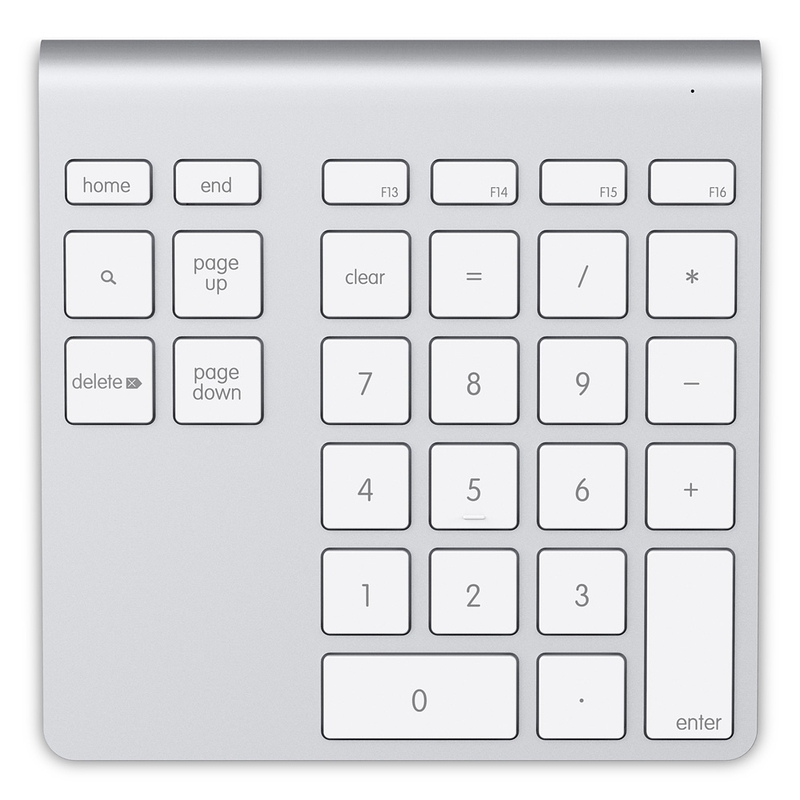 "…the numeric keypad Mac users have been waiting for…" - iLounge. Rated 1 out of 5 by Briansdagfadsg from Total Piece of Junk Connects to my MAC MAYBE 30% of the time. Just borrible. Rated 1 out of 5 by JusBelgium from Only trouble The problem is it's connecting to my macbook pro but the green light doesn't stay on so I can't use it. It's already my second one because the last one didn't connect anymore after 6 months so they replaced it. But now i still have problems. I don't use this regulary but it's annoying that when I want to use it, it doesn't work. Also i can't find a complete manual anywhere even though it says 'download a complete manual at the belkin website'. No I wouldn't recommend buying this. Rated 3 out of 5 by rhombist from Better than reviewed, still not terrific I researched fairly thoroughly before choosing to try this out, and I'm writing this review to hopefully help others in similar situation. 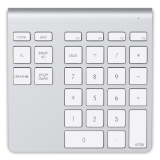 I have to use a Macbook at my company, yet I do a lot of number input/financial stuff, so I need a key pad. But I don't want the whole magic keyboard. This keypad, like all those I looked at, are rated and reviewed poorly, pretty much across the board. I selected this one because it is sold on the Apple store and I figured had the best chance of being returnable. The good: It works! with my MacBook Pro (15" 2018 running High Sierra 10.13.6) the keypad connected and when I press the keys, it works. The unit is nicely angled, stable, keys are easy to push, fairly responsive. Contrary to MOST reviews, I have not had any connection problems, drops in connection, etc. If you press a key while it's not connected, it's powered up and ready in about 1.5 seconds. Not bad. The meh: I always hated the silver aluminum macbook finish, which this has as well. It makes me cringe to touch it. The white plastic keys are meh. If I wanted a matchy set, I'd just buy the magic keyboard, I don't see why this must match. And my macbook is the darker finish of the 2018 macbook, not an option. I'd recommend they just make black or a neutral aluminum that would work with anything, but if you like it, it looks just like the old macbook. The bad: When connecting it to my macbook, none of the instructions that come with it, are online on the Belkin site, are listed on the Apple site, none of them are correct. The macbook connects up with the device just fine, but has no idea what it is. It thinks it's a keyboard and so goes into a loop of asking you to press the button next to the SHIFT key. Well, guess what, there is no shift key, and there's no other way out of that setup screen, so if you are looking for a satisfying resolution of installation, you will not get it. Your setup will fail, and you will have an entry on your Bluetooth menu that says Keyboard blah blah. It would be SUPER NICE if Belkin or Apple could configure something so that the computer knew what this particular device was, what keys it has, etc. Now, the good out of all of this is, it doesn't particularly matter, all the keys work fine (including the F13-16) keys. So it doesn't apparently need to finish installation gracefully to work. I also did have to replace the batteries that came with as many others have remarked. Would be better not to include them. So Giving this three stars. It works, even though it doesn't appear to install correctly. It is hideous looking, but functionally fine. In the week or so I've had it, it doesn't seem to have any connection issues. If I hadn't spent 3 hours researching better options and then troubleshooting the install process I would have given it 4 stars. If it was made of black or white plastic and had more ergo keys, it would get 5. Rated 5 out of 5 by largee22 from Dependable extra that makes work easy Bought with my new Imac from Apple. Although could have gotten the newer keyboard, I wanted to also have the flexibility of using it when I am on the road with my Macbook. I wish I would have done this sooner! Makes data entry so much easier and especially love the delete key to complement the backspace. The only downside was the initial setup. No problem connecting like insert says, but then it only partially functioned. I had to get on the internet and search for a few minutes to find out that you have to take batteries out and resetup for everything to work like it is supposed to. In box literature definitely needs to be fixed for idiots like me. Thank you for those troubleshooters out there that published how to fix things independently. Rated 1 out of 5 by Rbka9409 from Very disappointed! I received it yesterday night, and today a key is already missing. I can't get to connect to my MacBook Pro, today. You can't tell if is on or off because the green light turns off almost immediately. I try changing the batteries, still is not working. I thought because I was buying this from the Apple page it's quality was guarantee... my mistake for not going through the reviews first. Rated 1 out of 5 by Aedavies from Quit Working Purchased this and have only been able to use it a handful of times. It turns on with the green light, then shuts off right away, even after replacing the batteries.